With all the other fall-frenzied recipes floating around the interweb, I thought I could hold off on my own mania a little longer. It’s for your own good, really. I am practically restraining myself against the 15 cans of pumpkin I bought - last year - with the intent of getting a jump on this season. Yeah. So you know as soon as the first can is opened all bets are off. So, for a limited time only, I will delay all yall’s FitCakes-seasonal-foods-gratification, and instead give you a knockout cheesecake. For any time of year. The reason I had to do a cheesecake, and I had to do it now, directly correlates with the baking schedule in my culinary lab classes. You see, we recently baked cheesecake by the book. This means standard, good ol’ fashioned, stick-to-your-arteries, vanilla cheesecake. Now, I took some of this cheesecake – which looked all kinds of delicious – home to share with the husband. We tried it, enjoyed it, yet came away with two qualms. One was not enough lemon. Lemon is pretty much essential. The other was, well… we’ve had better. It was creamy enough to be eating straight ricotta, sure, but considering the sugar and fat content, it should have had a lot more flavor if it was gonna be worth the calories. Lucky for us, fat and sugar don’t have a monopoly on flavor. In fact, those guys are more like flavor-enhancers… backup singers, if you will. Rock stars like lemon and raspberry are my go-to infusions, given their bold and bright attitudes that cut through mellow cream flavors. 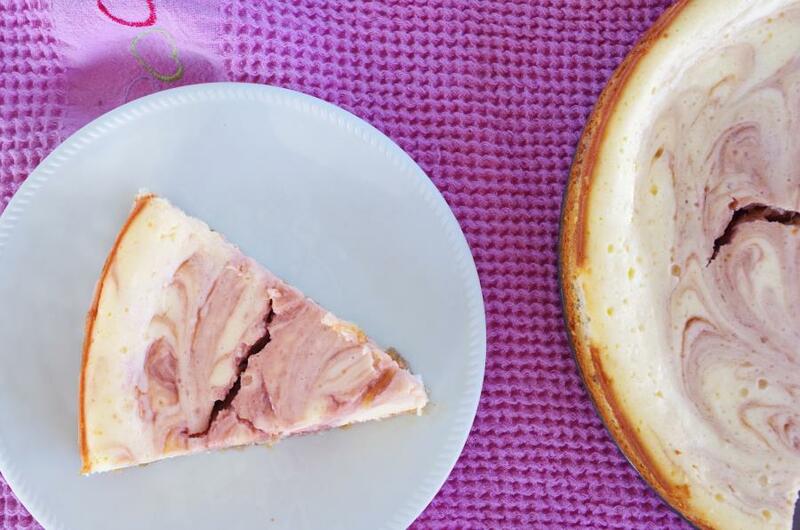 Blend those in with my momma’s already fan-freaking-tastic cheesecake, and you have a life-of-the-party cheesecake that won’t leave guilt and regrets in its wake! Original recipe nutrition for 1/12 slice: 398 calories, 27.3 g fat (15 saturated), 131 mg cholesterol, 33 g carbs (20 g sugar), and 6 g protein. Process lemon snap cookies and slivered almonds together in a food processor to a fine, even crumb. Add 1 tablespoon of juice or water at a time, processing between each, just until the crumbs stick when pressed together. Grease a 9” spring form pan with coconut oil or spray with baking spray. Press the cookie crust into the pan to form an even ¼” thick crust that extends a little way up the pan sides. Bake the crust 5 minutes, and set on a baking rack to cool. In a mixer - or with a hand mixer - fitted with a whisk attachment, blend Greek yogurt and cream cheese until completely smooth. Blend in sugar, and then blend in tapioca starch and lemon juice, zest, and extract. Finally, blend in one egg, scraping down the bottom of the mixer bowl to be sure it is fully incorporated. Repeat for the remaining eggs. Pour the mixture into the cooled pie crust and make sure it spreads evenly. 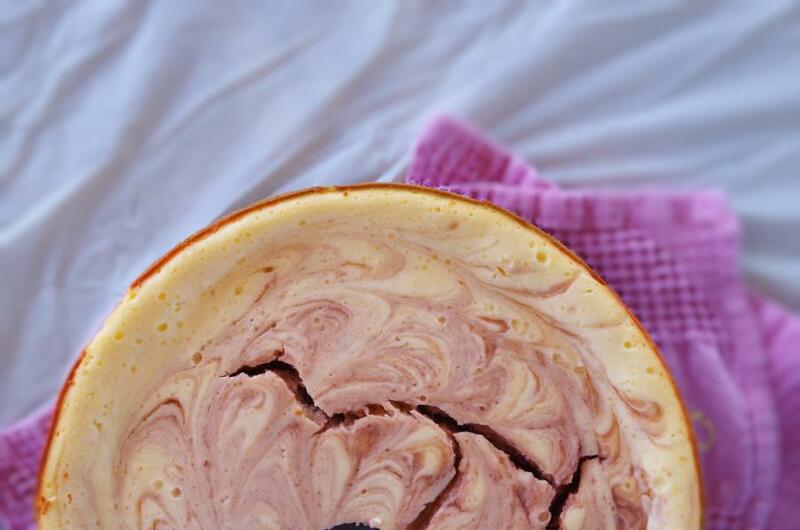 In a separate small bowl, combine the 1/3 c. raspberry jam and ¼ c. of the cream cheese blend. 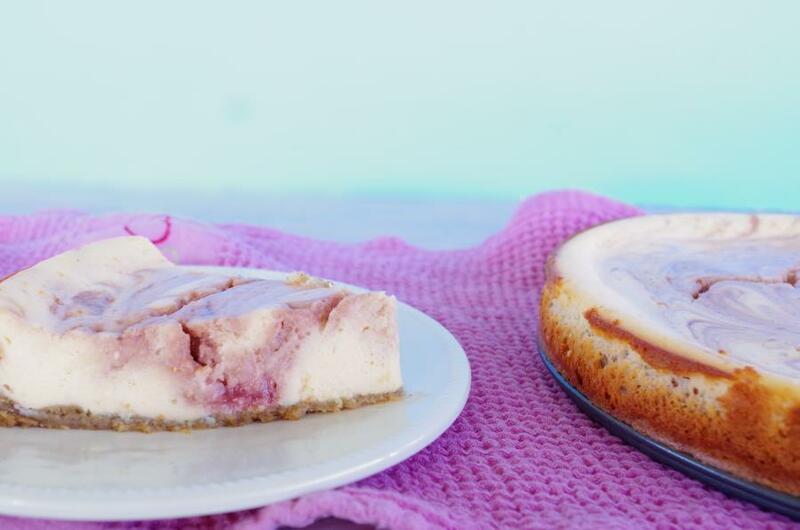 Spoon the jam mixture in splotches across the top of the cheesecake, and use a knife to swirl the jam throughout the cheesecake. 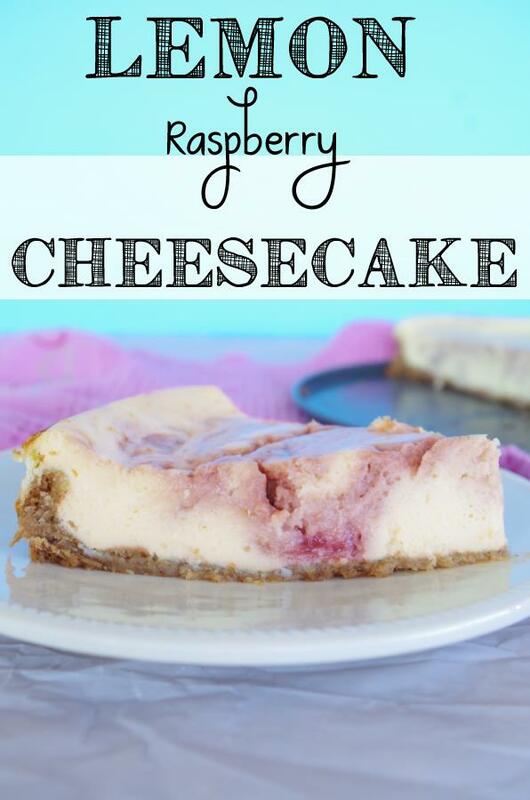 Bake the cheesecake in the center rack of the oven for about 1 hour and 10 minutes, plus or minus 5, until it is set – aka, the center doesn’t jiggle much when the pan is moved. Cool to room temp on a wire baking rack, then serve – or cover and refrigerate! Keeps well tightly wrapped in the fridge about 7-10 days… but who could keep this deliciousness from being gobbled up for that long? !